I just love this Project Bag. It keeps all my hand-sewing projects neatly contained and the vinyl keeps everything visible. I've made several of these in all different styles - many using scraps left-over from other projects. 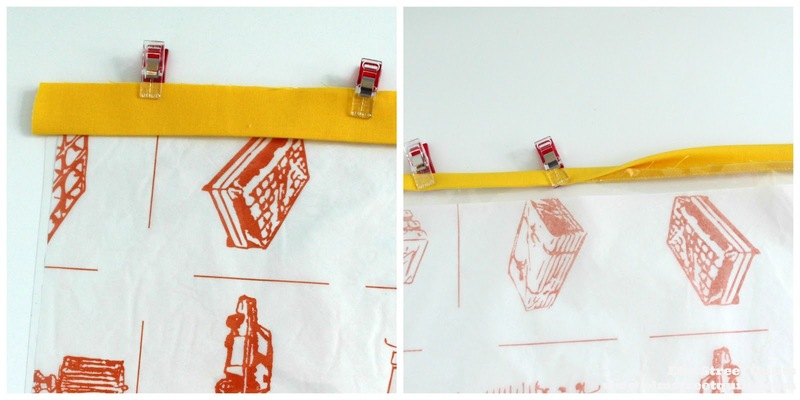 This tutorial is for the basic bag (the one shown in the very first photo.) Enjoy! Following manufacturers directions, iron fusible fleece to wrong side of main front fabric. Lay this unit on top of the wrong side of the main back fabric. Make a quilt sandwich and quilt lightly. For my sample, I used my walking foot and quilted lines every 1 ½''. Wrap binding completely around vinyl edge and top stitch. Finger press zipper binding in half, wrong sides together. Lay across top of zipper, right side of zipper facing up, aligning raw edges of binding with edge of zipper . The binding should be centered on the zipper and the zipper tab should be off to the left. Sew. Once sewn, fold binding up and top stitch. Place binding edge of vinyl unit on top of zipper, right side up. Sew. Lay zipper and vinyl unit on top of main unit, right side facing up. Align top edge and secure with binding clips. Move zipper tab to center. Sew a seam across the top at something smaller than ¼''. Sew from along right edge, starting at top, across zipper and taking just a few stitches in plastic. Repeat on left edge. Trim off extra zipper on both sides of zipper vinyl unit so that it is flush with main unit. Carefully trim vinyl on each side so that it overlaps the edge of main unit by about ¼''. (Vinyl can shift during sewing so we will retain a bit of excess at this step.) Likewise, trim bottom edge of vinyl. Apply binding to unit starting at the top as you would a quilt.. Align with edge of main unit and NOT the vinyl. Once the binding is attached, trim excess vinyl with scissors. Flip binding over to back of unit and secure by hand or machine. 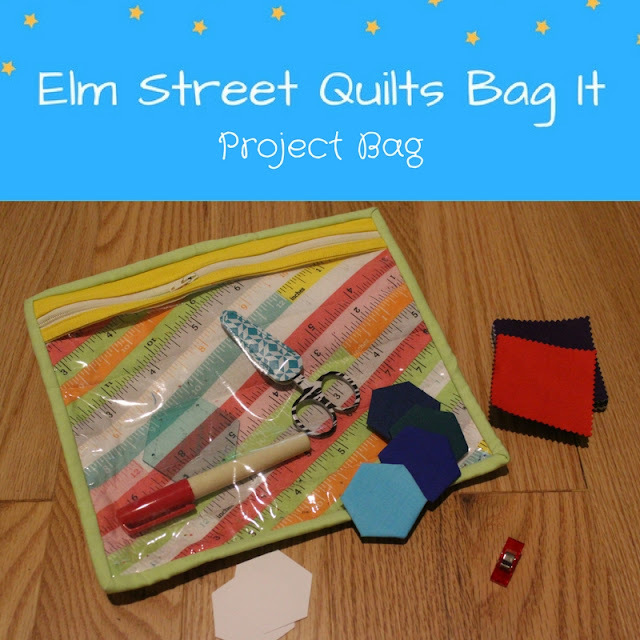 You can vary the size of your project bag to whatever dimensions you would like. Make sure you choose a zipper that is longer than the width of your piece by about 3 '' so that the zipper tab can hang off the edge during construction. 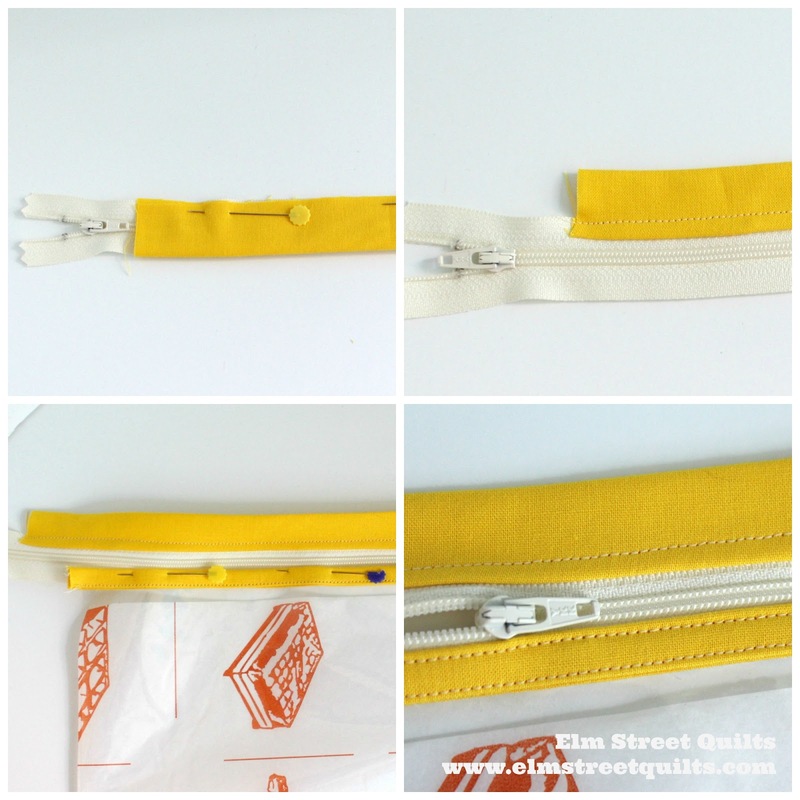 You can enclose the zipper inside a wider casing as in the two samples below. 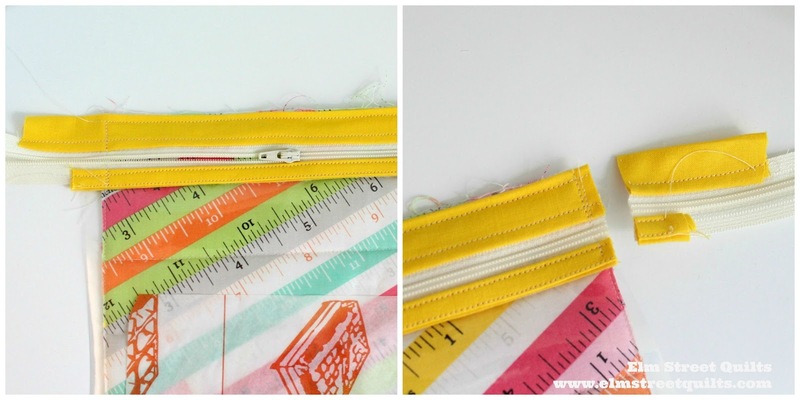 In these examples, fabric tabs were added to either side of the zipper before installing. Sandwich the zipper between the quilted casing and a lining piece of fabric. Consider adding a handle or a loop to your project bag. Thank you for the tutorial, Patty. Really like the pictures - very helpful. I am adding this bag to my to-do list for Christmas break. Great tutorial with excellent photographs! Excellent, very clear - like the vinyl :) Thank you! Patty, Do you recall what gauge of vinyl you used? I have a midweight vinyl, (12 guage) just wondering if that might be too thick. I bought vinyl a couple years ago to do bags like these, but that has fallen way down the list. Love yours! Thank you for the bag pattern. I bought some vinyl last year to make vinyl project bags and never got around to it. However, I now don't know what gauge vinyl it is. I'm assuming it doesn't matter, but I was wondering if there was a way to tell.